Last week, the national broadcaster ABC’s Media Watch program – Up in Smoke – took aim at the Murdoch press (in particular, the Australian newspaper) for misleading reporting. The News Limited rag (it is barely that) has been running a campaign via headline claiming that Australia’s world leading laws on plain packaging of tobacco products have failed. Of-course, News Limited is just the conduit. Lying behind the headlines are rather secretive right-wing think tanks who pump out propaganda every day which aims to undermine government intervention and activity in favour of the industrial and other interests that just happen to fund the propaganda. These organisations hold themselves out as being non-partisan and independent – only offering an evidence-based viewpoint. The only problem is they clearly do jobs for bobs and manipulate ‘evidence’ to the point of absurdity. 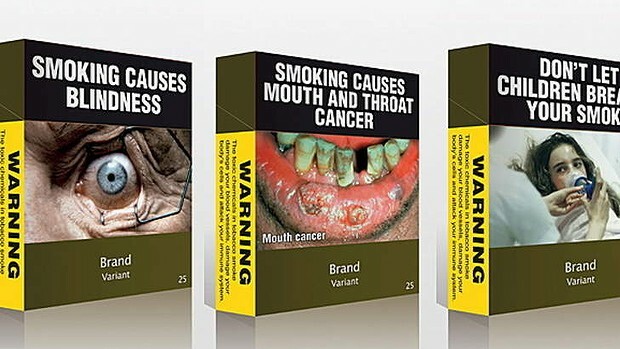 The – plain packaging – laws were enacted in December 2012 by the Labor Government, which was one of the better things they did while in office. For those who haven’t seen the graphic packages that the Federal Health Department requires be used by cigarette companies the following image shows three of the design variants in use. The research by industry monitor InfoView, which shows a rise in the market share of cheaper cigarettes from 32 per cent to 37 per cent last year, is backed up by retailers, consumer marketers and the industry, with cigarette-maker Philip Morris saying its information showed no drop in demand. Its data source is InfoView, which provides data to industries on a contract basis. breakdown of what goods and services households spend their money on. The chain-volume data (that is, after taking out the impact of price inflation) shows that the total consumption of cigarettes and tabocco has fallen by 5.3 per cent in seasonally-adjusted terms and by 16.5 per cent in raw data terms (original) since the December-quarter 2010. The decline in the March-quarter in real terms was 7.6 per cent (seasonally adjusted) and 18.5 per cent (original). The ABS data would seem to suggest that consumption has fallen. The Australian newspaper followed up with an article on June 18, 2014 – Cherry-picking stats an uncertain science – claiming that the volume data was ambigous because consumers may have substituted to cheaper brands. In other words, the way the ABS compute their chain-volume measures “doesn’t entirely eliminate substitution bias” – meaning that it is possible that volumes haven’t dropped even if the data says they have if there have been significant price falls in the recent quarter. The Melbourne Age economics editor, Peter Martin wrote about the impact of plain packaging of tobacco products this morning. The article – Plain packaging pushes cigarette sales down – is informative because it discloses to a wider audience how corrupt the major tobacco companies are in pushing out misinformation. So forget any (likely spurious) arguments about substitution bias rendering the ABS volume data totally inaccurate. Per stick data is as real you can get in quantity or volume terms. The Treasury data was published by the Commonwealth Health Department on June 19, 2014 – Tobacco key facts and figures. Clearances are an indicator of tobacco volumes in the Australian market. Who would you believe – the national statistical agency and the Treasury or an industry-funded body? The Health Department also provided this interesting graph taken from teh ABS National Health Surveys (the last one being 2011-12, just before the plain packaging legislation was enforced. The annotations are key government interventions in the campaign to stop smoking consumption. The data is in terms of ‘smoking prevalence rates’ since 1990. The first data relating to the period since the legislation will be released soon. Then we will see! The Health Department also pointed out that the reporting of “a major Australian daily newspaper” was “incomplete” and thus misleading. The “major Australian daily newspaper” is none other than ‘The Australian’ and in its June 6, 2014 article it claimed that for 2013 “16.4 per cent of all adults in the state smoke, up from 14.7 per cent in 2011”. While these figures are accurate, they are incomplete in that they do not report the 2012 smoking rate of 17.1% i.e. the 2013 smoking rate of 16.4% was less than the 2012 smoking rate of 17.1%. The increase in smoking rates between 2011 (14.7%) and 2012 (17.1%) is likely to have been due to a change in the methodology of the survey, in which mobile phones were included in the survey methods for the first time. This would have captured more young people, especially young men, who typically have higher current smoking rates. Manipulative reporting from the newspaper. Now it turns out that the journalist who wrote the June 6, 2014 Australian newspaper article, Christian Kerr has had links with the the right-wing, so-called ‘think tank’, the – Institute of Public Affairs (IPA). He is not currently listed as one of IPAs ‘People’ but Google retains a link to a page of his IPA publications – he regularly writes for the IPA review and has a long history of professional links to conservative politicians in Australia. Kerr has a history of writing articles about the “Nanny state” and accusing past Labor governments of funding researchers at universities and the Cancer Council of being paid “o try to bulletproof similar measures against challenge in global forums”. This was in relation to the plain packaging legislation and mooted challenges with the World Trade Organisation taken by a number of cigarette exporting countries (Source). The WTO case is documented – HERE. It revolves around the claim that the legislation breaches international trade rules and the intellectual property rights of brands. The Tobacco companies brought a similar case to Australia’s High Court and lost (Source). The author of the follow-up Australian article on substitution bias is on Sinclair Davidson, who is an academic but also Senior Fellow at the IPA and is always writing stupid articles about the ‘free market’. At the time the plain-packaging legislation was before the federal parliament, the IPA ran a very prominent campaign against the proposed law. It’s not for us to reveal our supporters … Whether we like it or not, the Australian democracy is not so sophisticated that companies can reveal they support free market think tanks, because as soon as they do they will be attacked. Attacked means that people will stop buying products from companies who they have a disagreement on values with. The IPA advocates free markets with full information. It is a valid position to consider the characteristics of a product to include social and philosophical values. Why would you want to give revenue to a company that actively funds organisations such as the IPA to manipulate government policy, which ultimately renders outcomes that are antithetical to your sense of decency and efficiency? THE Institute of Public Affairs has failed to disclose that it is receiving tobacco money, despite waging a strong campaign against the federal government’s plain-packaging legislation. “In the early 2000s”, when the IPA was less secretive it had “admitted publicly that it received money from cigarette companies”. The IPA director at the time also admitted before a government enquiry that the IPA doesn’t take positions at odds with its funders very often “otherwise they’d stop funding us”. Bobs for jobs! The IPA has also been a vehement attack dog against Non Government Organisations (NGOs) on the basis of their alleged “political activism”. In 2002, the former Federal MP Gary Johns, who at one point headed up the IPAs Non-Government Organisations unit (1997-2006), waged a campaign against what he called “civil society regulators” or “advocacy NGOs”. In a paper he presented to the Australian Senate in 2002 – Government and Civil Society: Which is Virtuous? – he railed against these organisations who had contributed to “the rise of a dictatorship of the articulate, the aptly named Culture of Complaint”. He was referring to organisations such as Oxfam, WWF, Greenpeace and Amnesty International and other NGOs that attempt to influence governments to improve outcomes for disadvantaged people. The irony is that the critics of liberal democracy — indigenous, feminist, gay, environmentalist, civil libertarian, socialist — have all had their greatest successes in liberal democracies. So the target groups are obvious. Organisations representing these interests “challenge the legitimacy of important elements of the system that sustains them”. In the most prosperous of times, in the most prosperous of nations, there is the invention of permanent poverty.17 In the most benign of modern production regimes, there is the invention of a permanent litany of environmental disaster.18 In the most egalitarian and peaceful of nations, there is the invention of a permanent litany of human rights abuses.19 The application of these civil society agendas to the liberal democracies shows a lack of objectivity and loss of sense of perspective and of magnitude on the part of the advocates. The thesis is that these NGOs have usurped the democratic voice of individuals and are less accountable than business. They are “totally unconstrained by the need to run candidates for public office” and, if successful, “damage the virtues of liberal democracy”. Specifically, an NGO should provide data about their source of funds, their expertise, their membership and the means of electing their office-holders. He claimed this was especially the case if government funds were given to the organisation. There was a controversy in 2004 when the IPA had been awarded a $A50,000 contract “to investigate how charities, welfare groups and aid organisations lobby government departments.” Source. At that point, there were many observers pointing out the hypocracy of an organisation that demands transparency and accountability from others (who they disagree with ideologically) but refuse to disclose their own sources of funding and networks of influence. There is a network of these right-wing organisations – moulded as single-issue campaign bodies – such as the H.R. Nicholls Society which wants complete deregulation of the labour market; the Lavoisier Group which “argues that climate change is nothing to worry about” Source; the Bennelong Society (now defunct) which promoted assimilation of indigenous Australians rather than self-determination and were “hostile to land rights” for indigenous Australians, whcih “delegitimises the British settlement of Australia” (Source). The IPAs last annual report made public via its homePage is the 2011/12 Report. In 2011, total donations received were $A561,917. In 2012, total donations jumped rather substantially to $A2,261,493. Total income for 2011 was $A2,425,405 and for 2012 it was $A4,002,427. But what do you think was happening in 2011-2012 for donations to jump by that much? Clive Hamilton’s article on February 24, 2012 – The shadowy world of IPA finances provides some clues. We might be confident to bet a lot more than that Clive! Relatedly, the IPA has been a solid propaganda machine for the climate change ‘skeptics’. It has led the way in Australia in promoting the denialist agenda. One such climate change sceptic/denialist is Bob Carter, who was a retired professor at James Cook University but retained a position there as an unpaid adjunct professor until the University withdrew his honorary appointment in early 2013. The University was accused by right-wingers of caving into the political correctness and allowing the climate change proponents to dictate its appointments. Carter is also the “Emeritus Fellow, Science Policy Advisor” at the IPA. The ABC Science Show ran a story on October 2, 2010 – Sceptics’ publishing record on climate – which focused on the academic publication record of Bob Carter. The ABC interviewed the Bob Ward from the LSE’s Grantham Institute on Climate Change and the Environment who said that a paper by Carter “contains false quotes and numerous examples of inaccuracy”. The paper was entitled ‘Knock, Knock: Where is the Evidence for Dangerous Human-Caused Global Warming?’ and appeared in the Economics Analysis and Policy, published by the Economic Society of Australia (Queensland) Inc. Volume 38, Issue 2, 2008. His paper reads like a piece of crude political propaganda, rather than “a critical account of the scientific arguments that have been claimed as evidence for dangerous, human-caused global warming”. In summary, Carter (2008) is possibly the most inaccurate and misleading article about climate change that has ever been published by a journal. He receives no research funding from special interest organisations such as environmental groups, energy companies or government departments. But as Clive Hamilton writes that is “a claim that on the scale of truth matches his reporting of climate science.” Why would he say that? In early 2012, Richard Littlemore wrote – Heartland Insider Exposes Institute’s Budget and Strategy – which reported on a suite of leaked documents from a former ‘insider’ of the US-based Heartland Institute. The Heartland Institute runs a major campaigns against climate change policy and tobacco regulation while pocketing significant cash from oil and tobacco companies. Graham Readfern article at DeSmogBlog on June 24, 2013 – Heartland Institute climate sceptic author has “no status” with Australian university – said that Bob Carter was working for the “climate science denying fossil fuel-funded free market think-tank” Heartland. Our current budget includes funding for high-profile individuals who regularly and publicly counter the alarmist AGW message. At the moment, this funding goes primarily to Craig Idso ($11,600 per month), Fred Singer ($5,000 per month, plus expenses), Robert Carter ($1,667 per month), and a number of other individuals, but we will consider expanding it, if funding can be found. I had a meeting a few weeks ago with a political activist who was thinking about ways to advance a progressive, social democratic agenda. I won’t disclose his ideas. But my advice was to suspend the plans and concentrate on raising millions of dollars from sympathetic progressive sources to fund the development of institutional structures (call them think tanks if you like) that can match it with the very well resourced right-wing propaganda machines, which courtesy of their own marketing capacities and the supportive News Limited/Fox media strength, pump their crazy stuff out every day irrespective of the evidence. If the evidence doesn’t help them they make up stuff as in the case of the recent tobacco data. I might mention that the introduction of Plain Packaging finally got me to give up smoking and I am grateful for it. I completely agree with your proposal regarding a “think-tank” to counter the IPA. Isn’t The Australia Institute (TAI) something that could fill the bill? Why create a new one if something useful already exists? My question is genuine: I don’t have a clear idea of where TAI stands politically or economically. We’ve got the right wing think tanks licked on the tobacco issue, at least in the advanced economies, as we can see from evidence of falling sales. They shoot themselves in the foot with arguments such as the one you’ve outlined. If plain packaging and health warnings aren’t causing sales to drop, why are they complaining about them? There’s a contradiction which should be obvious to all. We haven’t quite got them licked on climate change, we are just about ahead, and we’re well behind on economic education. It is useful from a progressive POV to be able to show that the same people who are spouting nonsense on these issues are one and the same as those promoting disinformation on the health effects of tobacco smoking. The Australia Institute does have a somewhat progressive slant. However,it appears to have links with the Labor Party which might clips its wings a bit. The global warming deniers/sceptics now have their very own Representatives and Senators in federal government as well as the states. Ultimately,the remedy for that is at the ballot box. In the meantime,pressure can be applied to tender spots through the usual recourses of a civil society,vestiges of which still remain. Take the time and trouble to write,email or phone the culprits. It is possible that some of them can count,especially where their self interest is involved. The Australia Institute means well but they don’t have the ticker to move out of the orthodox economic realm and into the MMT side of things. The aim for these contemptible groups is to set up market and regulatory conditions that allow entrenched businesses to maximise profit and eliminate competition. Social and moral considerations are thrown out the window to service a single minded agenda of greed. The environment is already stacked in support of profit seeking causes, and it is only the bottom line impact of negative public opinion that keeps any sort of restraint on rampant exploitation – hence the amount of resources spent on obfuscating motives and running PR campaigns. I think fighting battle on a per policy basis is warranted, but the war is won by ensuring the environment supports honesty and decency rather than duplicity and deceit. I agree on the desire for a group of people to fight back against the right’s bully boy tactics, albeit I’m not sure setting up a mirror-image IPA is going to work either. We don’t have a Netroots structure or a Daily Kos type leftist blogging hub in Australia, and we are the poorer for it despite there being a willing audience out there. A leftist Bolt or Blair could work here, I think. Someone prepared to take the low road, rhetorically, who isn’t a product of the insular MSM culture and doesn’t care about being branded as a partisan.